The Vector D-PDU API is a programming interface, standardized in ISO 22900-2, for accessing a Vehicle Communication Interface (VCI). Vector D-PDU API abstracts from the underlying VCI, especially from implementation of the communication protocol. As a result, an application which is based on a D-PDU API can be created independently of the VCI and in particular without a dedicated implementation of the communication protocol. Already existing Vector network interfaces can easily be extended with the Vector D-PDU API and are immediately ready for appropriate applications. The Vector D-PDU API uses the flexibility and features of the powerful Vector network interfaces. Therefore, it offers optimal performance for your applications. The Vector D-PDU API can share one channel of the Vector network interfaces with other Vector tools. So a customer-specific application can access the bus over the D-PDU API, while for example CANoe, CANalyzer and/or CANape run measurement or analysis tasks on the same channel. This eases for example also the troubleshooting in D-PDU API based applications. Vector D-PDU API is a cost-effective solution especially for OEMs and suppliers who already use the Vector network interfaces and who are additionally use or develop ISO 22900-2-based applications. Therefore, the Vector bus interfaces can also be used for customer-specific diag-nostic and flash applications. An additional VCI hardware is no longer required. 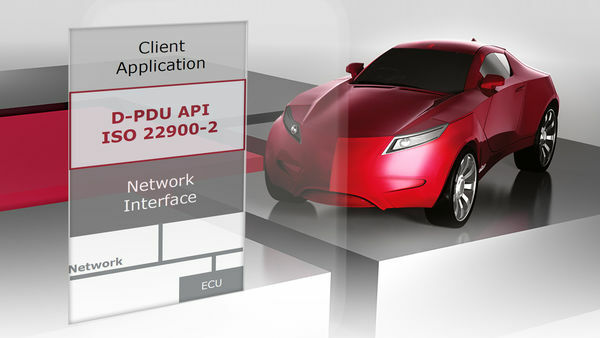 The D-PDU API from Vector is used in the field of ECU development and diagnostics to create various OEM-specific applications such as diagnostic testers. 32-bit or 64-bit applications can be developed flexibly and efficiently based on the 32-bit or 64-bit library. It lets developers focus on the application logic. In addition, the D-PDU API enables the use of Vector network interfaces in applications that are based on an ISO 22900-3 conformant diagnostic server. Supports up to 8 CAN/CAN FD channels on one Vector network interface (e.g. VN7572 or VN8970). The Vector D-PDU API library can be used with the Vector CAN and Ethernet network interfaces.